The Staff was very friendly. The waiter we had in the restaurant that night was extremely friendly & tried his best to be accommodating even though things on the menu we tried to order were not available. Great staff both in dining room & reception. Excellent service. Comfy beds & pillows. Close to Gatwick yet quiet neighborhood. Good gym. Nice restaurant and food. Very nice personnel. Near Sainsbury commercial area, and 10mins walk to Crawley center. Excellent location with easy transportation to Gatwick. Excellent breakfast included with our booking. Shopping and restaurants within easy walking distance. We found Crowley delightful. They were full and upgraded our room, so the room was pretty wonderful. Room comfortable and clean and in-room tea/coffee was handy on arrival, staff pleasant and responsive... a small issue with TV was solved within minutes. Excellent venue, easy to find, lovely staff nothing seems too much trouble. Lovely lounge for a late drink. Overall one of the better hotels I have stayed in. Crowne Plaza London - Gatwick Airport This rating is a reflection of how the property compares to the industry standard when it comes to price, facilities and services available. It's based on a self-evaluation by the property. Use this rating to help choose your stay! Gatwick Airport is 4 miles away from the hotel, and a pre-bookable airport transfer is available for an additional charge. 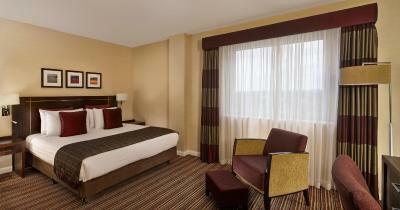 Crowne Plaza London - Gatwick Airport features free WiFi and a fitness center. The Cube Restaurant offers modern English cuisine and classic international dishes, using local produce. Bar92 serves Starbucks coffee and a range of light meals and snacks all day. Guests can enjoy the heated outdoor terrace, and 24-hour room service. The hotel offers a park and fly package. There are also meeting rooms available for up to 280 people. This Crowne Plaza hotel is just 5 minutes’ drive from the M23 motorway and 7 minutes from Crawley Railway Station. This hotel is a 15-minute walk from Crawley town center. When would you like to stay at Crowne Plaza London - Gatwick Airport? This air-conditioned room features an private bathroom, a TV and tea/coffee making facilities. Bose speakers are provided in all Club rooms. This double room has air conditioning, bathrobe and electric kettle. Bose speakers are provided in all Club rooms. House Rules Crowne Plaza London - Gatwick Airport takes special requests – add in the next step! Crowne Plaza London - Gatwick Airport accepts these cards and reserves the right to temporarily hold an amount prior to arrival. Parking costs GBP 10.00 per night and there is no need to book in advance. Please note that you must register your car on arrival at the hotel or risk a fine. The hotel offers a shuttle bus from the hotel to LGW Airport for a cost of GBP 3 per journey, which starts at 04:30. Alternatively, our reception team can book a taxi for you and this will cost GBP 12.00 from hotel to airport. If you want to use room service, the hotel will charge GBP 50 on your card to cover any costs. Had a club room which was lovely. However if you have heavy luggage be prepared to take it yourself to the room and to have a long walk. Room its self was well appointed and a clean. it was very hot in the room, couldn’t turn down the heating. The air conditioning system was noisy and I couldn't stop it in the off or on position so the noise was disturbing me all night. The controller had no cover. I had a drink in the bar and bought some nuts to eat. the packet was sticky to hold and transferred on to my hands, . It wasn't visual, staining or smelly, not a pleasant experience. The breakfast was extremely disappointing, I was down at around 0645 and the following items were terrible, Bacon hard and hard to eat, Black Pudding dried out and tasted like cardboard, tomatoes pasty. The orange juice was not good in fact it tasted of artificial sweeteners, the serving plates were all cold. No member of staff came to ask if I wanted omelette, or fish. I did report this to reception the next day, the feedback form was a small business card sized document, not something you would normally get, but given time constraints, I had a meeting to go to, its what is used. I booked the trip for free parking which you offered when I arrived at the hotel they made me pay. The service at the bar was poor and expensive as was the breakfast. I would not reccomend and use again. The hotel blamed booking.com for the parking error so I would probably not use your services again also. Breakfast not included also you lied regarding the EV charging on site. You told us that you just give your reg to reception and go and plug in. This is not the case . !!! This requires a card that I didnt have. Lovely hotel. Great breakfast. Stuttle to airport was on time and driver was very friendly. I couldn't believe a small glass of apple juice was £2.75 and there was a 10% charge to pour it out of the carton!! We booked the club lounge and it absolutely wasn't value for money. The wine was undrinkable and the pre-dinner snacks virtually non existent. The bed was extra comfy and the staff were very friendly. Check was very easy and we had a great room on the club floor with great facilities and very quiet.